Yesterday I attended the RTW Forum presented by the Insurance Work and Health Group (IWHG) headed by Professor Alex Collie at Monash University in Melbourne. Although it might seem like a dry subject, I found it very relevant and interesting and a great bunch of people too! There was a lot of constructive interaction in the discussion sessions. There was quite a lot of interest for Tasmania with two of the research projects specifically looking at Tasmanian legislation and practices. I think I was the only attendee from Tasmania, unless you count ‘defectors’ who have moved from Tasmania to live and work on the northern island! Notable attendees included Alan Clayton, Safety@Work Blogger Kevin Jones and Stephen Campbell from Campbell Research & Consulting. I have previously presented evidence about the situation in Tasmania at the TAVRP meeting last year, as summarised in my article The State of Play in Tasmania. The IWHG forum added some more detail about inter-jurisdictional comparisons and some further insights into Tasmania’s system, most specifically the outcome from the introduction of the Return to Work and Injury Management Model (RTWIMM) following the 2007 Clayton Review of Tasmania’s worker’s compensation scheme as well as some interesting data about the effects of penalties for late reporting by employers. The forum was presented by Alex Collie, Tyler Lane, Luke Sheehan & Shannon Gray using evidence from the COMPARE Project with the indomitable Mark Stipic as Master of Ceremonies. Professor Collie opened the forum with discussion about the burden of disease affecting the Australian workforce. Amongst a workforce of about 11 million there are reports of half a million work-related injuries each year, but only half that number of actual workers compensation claims. In working age groups, musculoskeletal disorders and mental health disorders are by far the most important conditions. Mental health disorders predominate in younger working age people and musculoskeletal conditions dominate in older workers. The slide below illustrates this very nicely. Tyler Lane presented a study on the Impact of Legislative Change. He discussed his enthusiasm for “natural” experimentation opportunities created by the relatively frequent legislative changes and presented data and his analysis using the “interrupted times series” methodology. One problem identified though is that legislative changes often include a number of changes introduced at the same time making it difficult to sort out cause and effect. Perhaps legislators should stagger the introduction of changes to make a researchers job easier? He presented two studies, both relating to Tasmania. The first about the impact of penalties on employers for late reporting of injuries in Tasmania and South Australia and the second about the introduction of the Return to Work and Injury Management Model (RTWIMM) in Tasmania. Unlike in SA, the introduction of employer penalties for late notification in Tasmania didn’t coincide with introduction of provisional liability provisions which might have encouraged employees to notify injuries more quickly. The evidence suggested that any shortening of times to report injuries by employers may be counteracted by insurers taking longer to make liability decisions. It is a complex picture, but the evidence doesn’t detract from the principle of the value of early reporting. In the discussion, it was also evident that, while their might be legislative intention to change practice, this might not actually occur in practice. Alan Clayton suggested that in Tasmania for example much practice is not in accord with legislation. Further it was suggested by an audience member that, anecdotally, in the Tasmanian jurisdiction the penalties were rarely actually applied in relation to late reporting of injuries by employers, because of market forces! My comment about the introduction of the RTWIMM was that the new role of Injury management Co-ordinator (IMC) increased complexity and administrative burden for the insurers and other stakeholders causing confusion. There was (and still is) confusion between the role of IMC and Workplace Rehabilitation Provider. An additional factor is that IMC’s who usually are employed by insurers cannot act independently in accordance with legislated intention because they report within an insurer’s hierarchical reporting system ultimately controlled by claims managers. 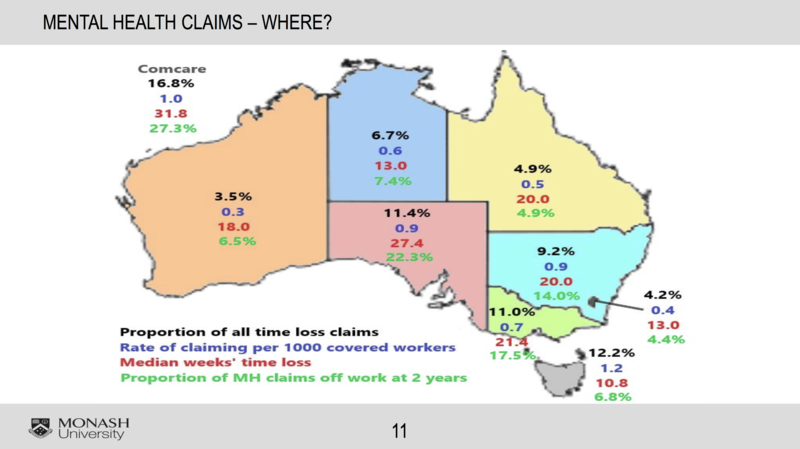 Differences in claim patterns for mental health disorders were evident around Australia with Tasmania having the highest incidence of such claims – 1.2 claims per 1000 workers (higher even than Comcare) but the best rate in Australia in terms of median time off work (compensated time off) at 10.8 weeks, compared to 31.8 weeks for the highest, Comcare. There was also data confirming the high level of risk in First Responder organisations with different patterns between Police, Firefighters and Ambulance Officers. Nothing really surprising here. While the research presented by IWHG is based on data from the National Workers Compensation Data Set and the RTW survey as well as the natural experiments that occur with legislative change, in the discussion the researchers expressed interest in accessing data from other sources, such as life insurers or data that relates to an individual worker’s particular history. Forum participants also highlighted issues with delay in access to data and limited availability of data to other interested organisations. The studies being presented relate to historical data sometimes many years old. It is increasingly recognised that there is a need for “real-time” data to provide more immediate feedback about effects of scheme changes. Alex Collie expressed the view that there will always be some ‘art’ in combination with ‘science’ to the management of work-related injury, but his hope was that the science component could be increased. I suggested however a third element, that of “political ideology” – that also had significant influences on some WC management approaches. 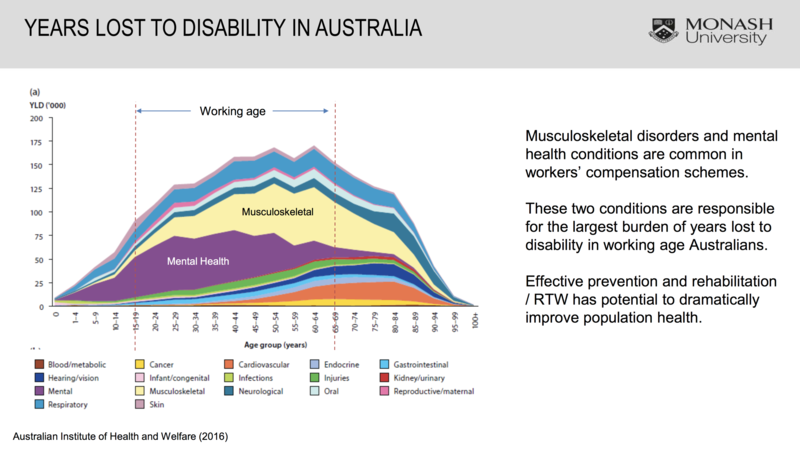 In answer to a question about the overall direction of workplace health in Australia, Alex Collie suggested that prevention of physical injuries has improved significantly, but that the incidence of mental health disorders was increasing with the overall burden of work disability (taking into account both claims incidence and duration rates) probably still increasing nationally. It is also evident that there is very little data about the extent of secondary mental health disorders, as most data provides only diagnostic information about the primary injury. Secondary disorders are, in my experience, almost universal in complex and protracted claims. Congratulations to the IWHG for another informative forum.